Nowadays, when people reference “demons,” they don’t usually mean a horned gremlin from Hell. But, if you think about it, belief in demons and demonic deities is still very prevalent in our culture. The Exorcist, Buffy the Vampire Slayer, and American Horror Story: Asylum have all featured demons in one form or other. These creatures were pitted against the heroes of the story in a classic battle between and evil. But that’s not to say demons are only referenced in fiction. The most sinister of demons aren’t on TV or in movies, but in obscure stories from Christianity and other religious lore. Here are some demons that we’d really like to see in the next season of American Horror Story. 1. 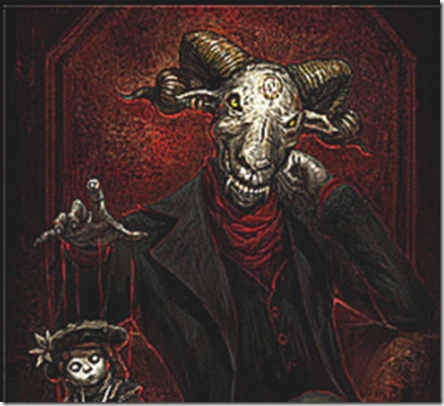 Asag is a demon from Sumerian mythology who causes sickness. In his spare time he likes to perform sexual acts on mountains so that he can chill with his legion of rock monster spawn. 2. The female demon, Abyzou, is a Jewish horror that is responsible for any miscarriages. She herself is infertile so her proceeds to kill children out of jealousy. 3. A harbinger of old souls, Ronwe comes to Earth to feed when it’s time for relatives to die. 4. Barbatos is a duke of Hell who specializes in giving people the ability talk to animals and helping pirates find buried treasure. 6. The warrior demon Duke Eligos knows the outcomes of every future war, all the way down to which soldier killed which. He has a serpent tail and rides a horse he stole from the Garden of Eden. 7. Buer is supposedly a “president” of Hell, but it is unclear if he was ever actually elected by his demon peers. He has a penchant for poisonous herbs and based on how he looks here could probably do a sick cartwheel. 8. The common depiction of Agares from Christian demonology is an elderly man riding a crocodile with a hawk resting on his arm. He is a duke of Hell who teaches many languages, but only the curse words and horrible ethnic slurs of each. 9. King Paimon is one of Lucifer’s most loyal lieutenants. He has a bizarrely specific way of being conjured and when he comes the conjurer must endure a series of intensely personal questions to appease him. 10. Aka Manah from Zoroastrian legend controls the evils of the mind such as sexual desire and greed that distract people from being wholesome and good. This is why he is often depicted controlling people like a marionette. 11. Lady Midday is a Slavic demon who floats around workers toiling in fields, asking them tough questions. If they answer incorrectly, she removes their head with a scythe. 12. The Christian demon, Belphegor, is one of the seven princes of hell is often associated with orgies and general debauchery. His favorite number is 1000000000000066600000000000001 and he is Hell’s ambassador to France, oddly enough. Also, if there is a demon in charge of me desiring pizza really late at night, he’s been killing it lately. Oh, the horrors the pizza demon has inflicted on my stomach while I lie in bed at 1am. Pizzafueger, how dare you!